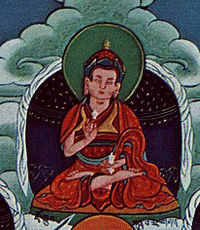 Patrul Rinpoche Kunzang Shenpen - Iconographic representation painted by Gonpo Tseten Rinpoche, his heart-son. Tsö Patrul Rinpoche aka Patrul Rinpoche Kunzang Shenpen Özer of Tsö (twentieth century) — a student of Adzom Drukpa and an immediate reincarnation of Patrul Rinpoche, born near Repkong in Tsö, Amdo. He was born to the niece of Thupten Chökyi Dorje, the great 5th Dzogchen Rinpoche, and recognized and enthroned by that sublime master. Nyoshul Khen Rinpoche's book A Marvellous Garland of Rare Gems recounts the biography of Tsö Patrul, the hardships he undertook to make his way to Adzom Drukpa, his root guru, the host of profound teachings he studied, and the mastery of the winds and channels which enabled him to demonstrate innumerable powers which signified Tsö Patrul's spiritual accomplishment. He was among the most extraordinary heart-sons of his guru and perfected the paths of Trekchö and Tögal. According to Dilgo Khyentse Rinpoche, Patrul Rinpoche of Tsö was an emanation of Avalokiteshvara and a very unusual person who would feed hundreds of beggars at his monastery upon condition that they enter the gate of the Dharma and undertake the ngöndro preliminary practices. 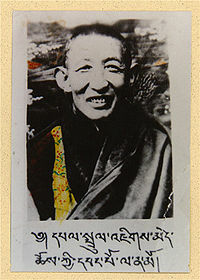 Patrul Rinpoche of Tso's principal successor was Gonpo Tseten Rinpoche. Nyoshul Khenpo, A Marvelous Garland of Rare Gems: Biographies of Masters of Awareness in the Dzogchen Lineage, Padma Publications, 2005, pages 456-457. ↑ Photo identified as such by Jigme Namgyal Rinpoche (b. in 1956 at Repkong, Amdo); his root guru was a main disciple of Tsö Patrul Rinpoche. ↑ Dilgo Khyentse Rinpoche, Brilliant Moon: An Autobiography of Dilgo Khyentse Rinpoche, Shambhala 2008, page 135. This page was last edited on 8 December 2017, at 17:07.